Making lunches day in and day out can get rough! It doesn’t matter if you are packing up a lunch box to send to school with your child, or fixing lunch for your toddler at home – coming up with ideas can be difficult. It’s so easy to get into a lunch rut or start to rely on frozen and boxed foods. I am a big fan of sandwiches for lunch. They are quick and easy to prepare, filling, delicious, and affordable. Sandwiches are also INCREDIBLY versatile and so easy to change up based on your child’s likes/dislikes and what you have on hand. I wanted to come up with a list of simple, kid-friendly sandwich ideas to help jazz up your lunchtime routine. Enjoy! *My Supermom tip: Mix it up when it comes to your peanut butter!! There are so many tasty varieties out there that even if you stick with just a PB&J, your sandwich can be different just about every day of the week! Right now we have a jar of SKIPPY® Creamy and a jar of SKIPPY® Super Chunk. 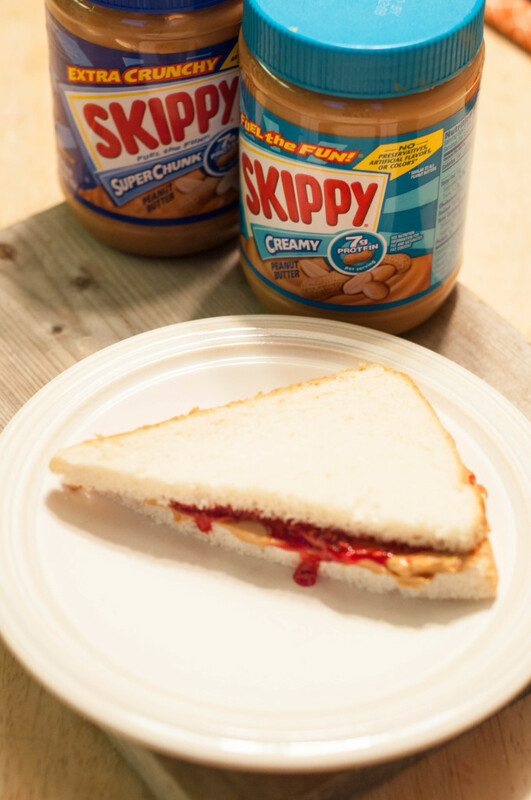 We just finished off our SKIPPY® Creamy with Salted Caramel and also love the SKIPPY® Roasted Honey Nut! *My Supermom tip: Mix it up when it comes to the veggies and spreads you use! Try mayo one day, mustard the next, and pesto the next day! Offer lettuce, pickles, and sliced tomato. Try a variety of different cheeses. Offering kids choices and exposing them to a variety of different flavors and ingredients is key to creating well-rounded eaters. Make any of the above a “club” with a slice or two of bacon and that extra piece of bread! Pizza Sandwich – Spread two slices of bread or a bagel with tomato/marinara sauce, top with some mozzarella, and a few slices of Hormel® pepperoni! This is one of our favorite lunches!! Leave me a comment with YOUR favorite kid-friendly sandwich! Let’s help each other stay out of that lunchbox rut!